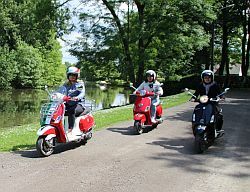 Vespa rental starting from €25. 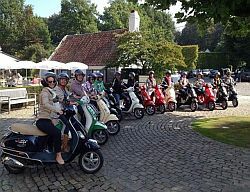 La Bella Vespa is a family business specialised in organising Vespa tours, corporate events and teambuildings. 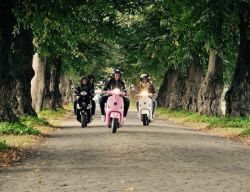 We offer you the opportunity of a pleasant and comfortable way of enjoying a relaxing tour on a trendy, hip 50 cc Vespa with your colleagues, clients or friends. 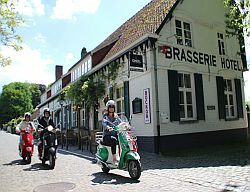 You and your group can enjoy the scenic Leiestreek with the artists’ village Sint-Martens-Latem, the picturesque Deurle, one of the most beautiful villages in Flanders, and the surroundings of Ooidonk Castle. Alternatively, tour through the wonderful rolling hills of the Flemish Ardennes, the Tuscany of Flanders or the centre of Ghent. You can choose from various routes, which can be combined with a romantic boat trip on the Leie and one of our restaurant arrangements. We can also propose alternative routes and restaurants at any desired location on request.